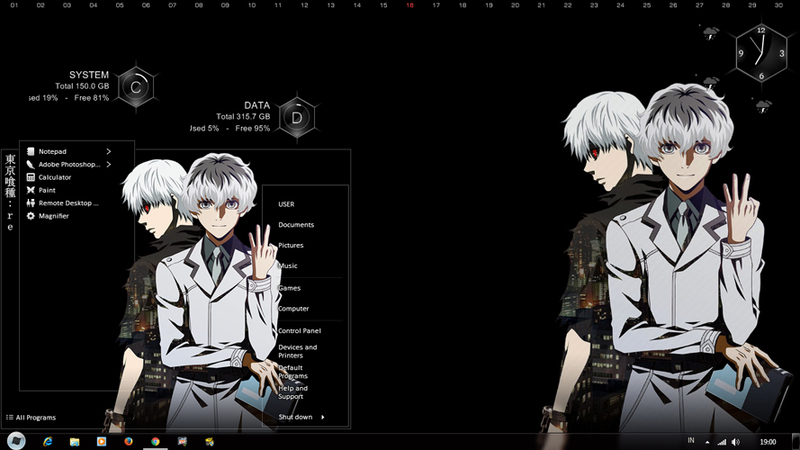 Last Saturday, I updated a new theme, that is theme anime windows 7 Tokyo Ghoul Re that adapted from the Windows 10 version. 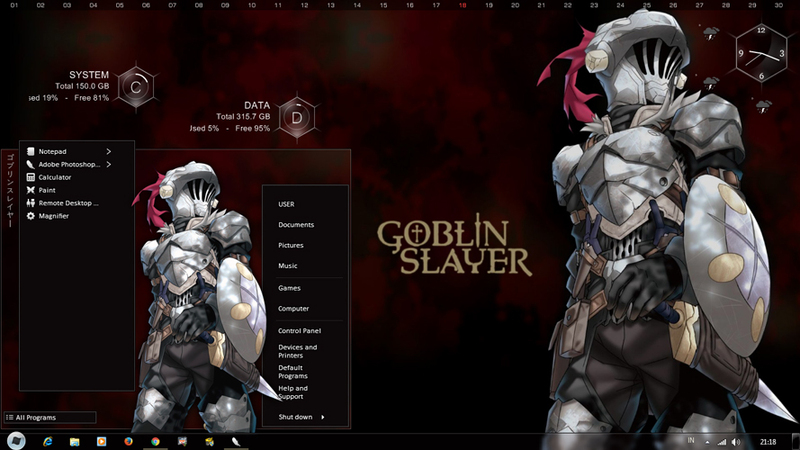 And today, I share another Windows 7 anime theme, Goblin Slayer. Hello guys, how are you? I hope you are always fine. 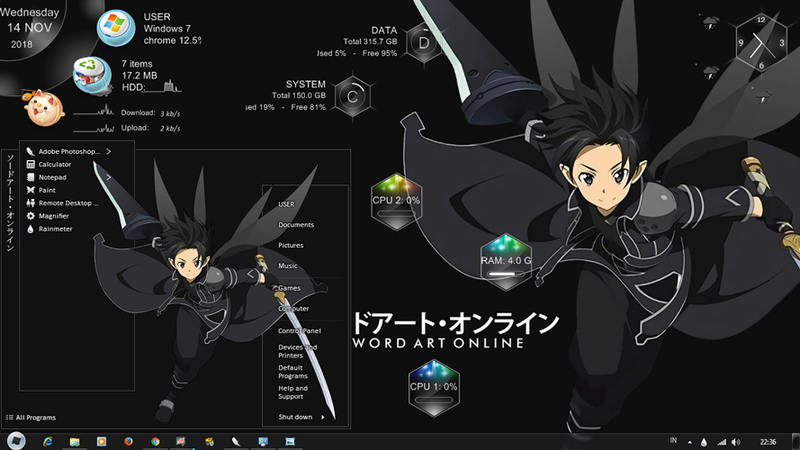 Today, I share one anime theme for Windows 7 again. Still from one of the anime that I previously created the Windows 10 version. Namely Tokyo Ghoul Re. Hello guys, I just finished making a new theme. Still from fall 2016 anime, this time I chose Drifters. This may be a little late, because we are now entering the winter 2016/2017 anime season. But I hope you will love it. Fortunately, I was not too difficult to find images of this anime. So it is pretty easy to make this theme. And this time I used 3 images for background folder. So guys, if you are one of the fans of this anime, don't hesitate to download this theme. Yo whats up guys, although late from the schedule that I expected. But I've had promise to share this theme. This week I had to go with my family for a quality theme. So, this is the best time that I could choose. 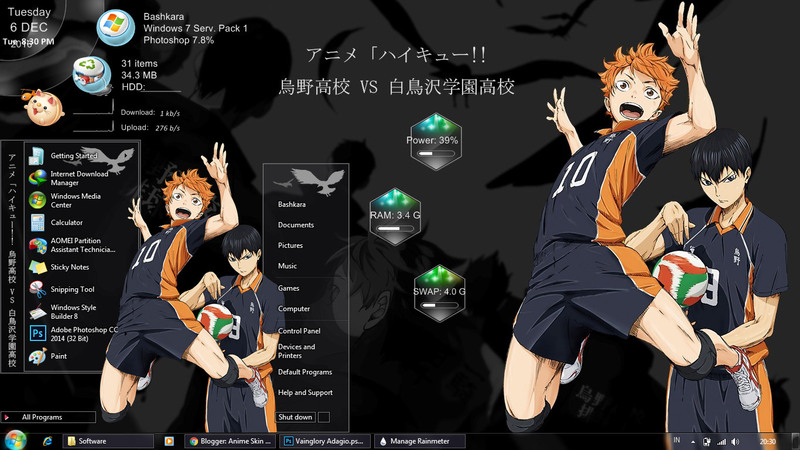 Actually, long ago I wanted to make a version 2 of Haikyuu theme when it was season 2. But I can not do it, and now I make it up. 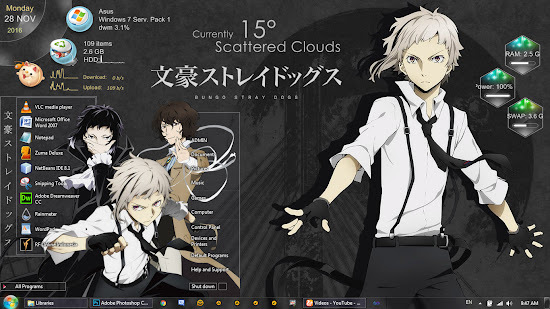 I made this theme with bungou stray dogs's msstyles, because the basic color for this theme is same. 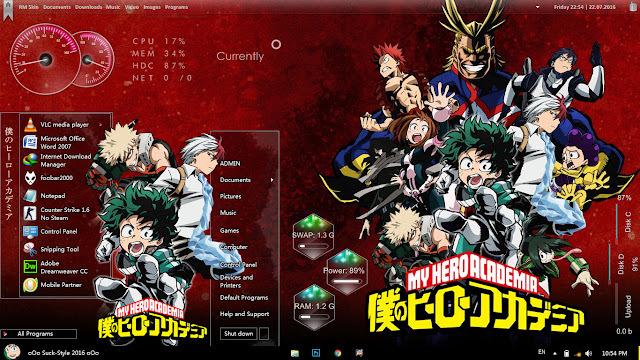 So guys, today I would like to share a new anime theme from anime fall. That is Bungou Stray Dogs. I don't know exactly what anime is about, because I do not watch it (you don't say :v). But I saw it on anime trending page on facebook, that, this anime is in the top ten of anime fall (still ongoing of course). So, I was interested to make the theme of it. And I hope you guys will love it too. Hi guys, how are you today? I hope you guys always fine. Today, I would like to share new windows 7 theme again. This time, I still choose an anime from last season, that is Boku no Hero Academia. Actually, I have finished this anime theme for windows 8.1 too. But I think I will start it from windows 7 first. Unfortunately, I can't put all of the characters on the start menu, so I choose the best for it. 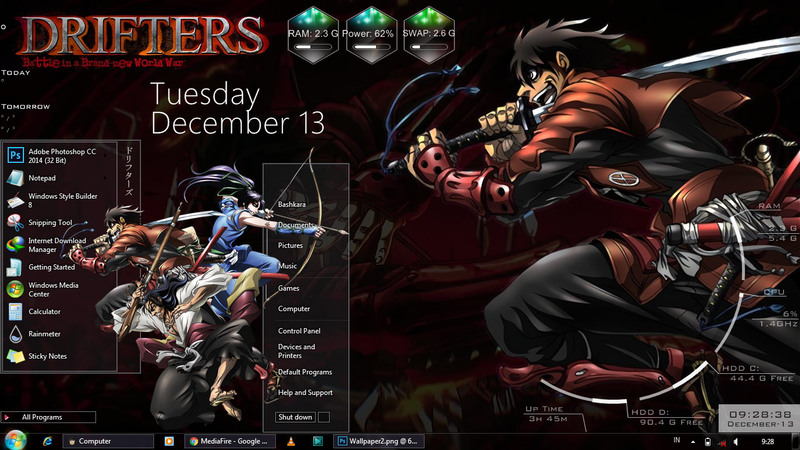 Then, the special from this theme is I have made the start menu with 2 version. Well, it's been a long time I never make a theme like this again. The 2nd start menu only appears when you hover your mouse to a program that has the history such as this image below. Haha, I don’t know where to start. Today I come back to my blog with new windows 7 theme. As my promise on fan page post yesterday, now I would like to share this new theme for you. That is Re:Zero kara Hajimeru Isekai Seikatsu, anime from last season and still ongoing. 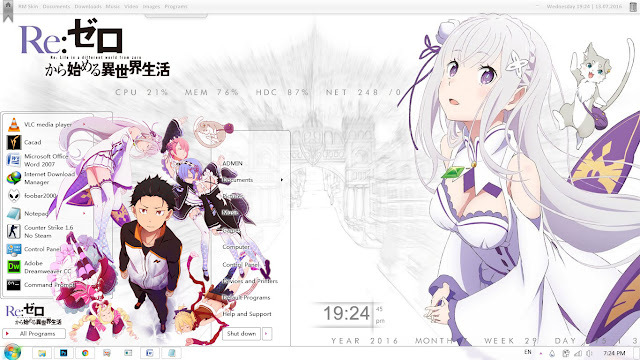 Why Re:Zero? Because my facebook homepage filled with posts about this anime, I think this theme is appropriate to come back. Difficult in the beginning, but I can handle it. I still use the same style like before. The problem is just in the picture. Luckily, I got some beautiful pictures to make it.